The majority of articles and abstracts about resin point out that it is named "zhivitsa" in Russian thanks to its ability to heal wounds effectively and rapidly (the verb "to heal" in Russian, zazhivit, has the same root). This is, of course, true, but there are other, more substantial reasons for such an evocative name. 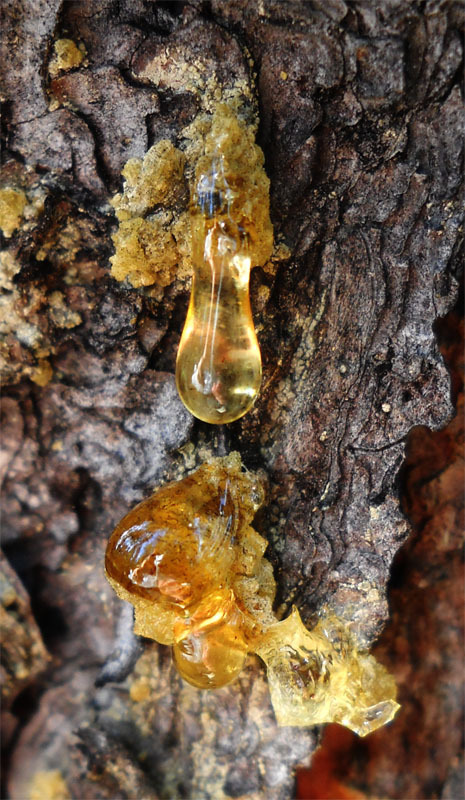 According to Jack Tresidder's dictionary of symbols, resin signifies immortality, a symbolism based on the popular belief that resin is the undying spirit of long-living trees. Many examples may be cited of the special relationship of various peoples to this mysterious substance, but the purpose of this article is to solve the riddle of this unanimity: perhaps our ancestors knew something about resin that we are only just beginning to learn through the misty veil of time. So, where shall we begin? I, for example, would be interested to discover just what botanists and chemists think about resin. If you do the maximum amount of sifting through the scientific slang, you find the following. Resin is a substance excreted by plants during normal physiological metabolism, and also in the event of physical injuries for the healing of their own flesh. It is produced by special tissues of the roots, leaves, wood, and internal bark - the sapwood. The living epithelial cells in which resin is formed divide, forming resin channels or passageways. These channels are often strongly branched, so that in the event of an injury to one of them, the wood resin begins to flow to the injured portion from far away. Scientists are surprised that sometimes wood resin is found inside cells and cell membranes. It is not being used as reserve nutrients, so what is the biological sense of the presence of wood resin there where it should not be? I have a hypothesis that the wood resin appears in cells and cell membranes when the necessity arises for the plant to defend itself against the unfavourable effect of the environment. When reacting with oxygen, wood resins easily oxidize, and in the oxidized state become unusually resistant to external influences (it is interesting that this circumstance is well known to scientists, but they have not succeeded in analyzing it and coming to any conclusions). Wood resin exerts a similar action on the human organism as well. When you ingest resin, you are insured for several hours against the harmful influence of toxins entering from the environment. 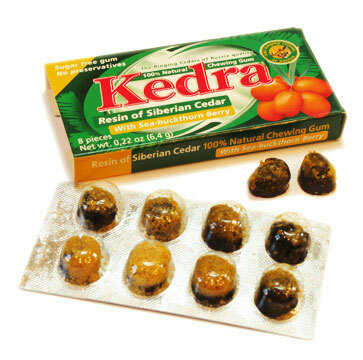 Chewing Siberian Cedar Resin "Kedra"
What is resin made up of? Volatile substances make up 30-35%: resinous spirits and their ethers (turpentine and its derivatives), and oxygen compounds. 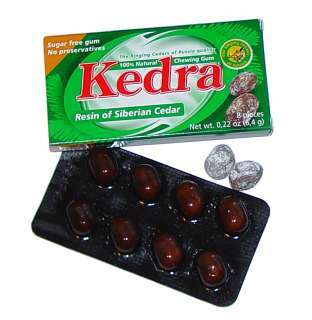 There is a wide spectrum of fatty and resin acids (including succinic acid), plant matter, vitamins C and D, and also substances of an obscure nature, known under the name of rubbers. Wood resins included in the composition of resin are substances that are hard and amorphous - that is, they do not have a crystalline structure. They do not dissolve in water, but yield to organic solvents, such as alcohol, and fatty and essential oils. Wood resin molecules are connected to each other not by chemical bonds, but by intermolecular cohesive forces, which are easily disrupted when heated or dissolved. In the process, on the surface of solutions appear free, unconnected molecules of the resin components that have a large supply of free energy. Because of this energy, they are able to capture and hold molecules of other substances that approach the surface of the solution. This property of wood resin makes it possible to concentrate or intensify its properties by the addition of other natural components. So, let us repeat, wood resin is found in the state of a volatile solution in plants, and this substance is called "resin (zhivitsa)." Over time, the essential oil evaporates, the resin hardens, losing its stickiness and strong aroma. Even so, a small quantity of essential oil still remains. Even amber, which has lain for tens of millions of years in the earth and become hard as rock, contains approximately 6% essential oil. It can be completely removed only by distillation, that is, heating it to a high temperature. The amazing long life of wood resins can be explained by their suppressive action on microflora, which, on the one hand, cannot use wood resin as a nutritive substrate, and which, on the other hand, dies under the effect of its bactericidal properties. And the main thing is these properties may be preserved over the course of millennia. You must agree that all this is interesting. 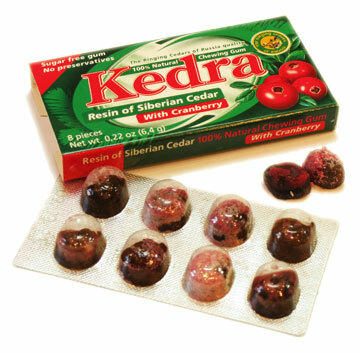 And for a person who has experience in using resin, this explains much. Once ingested, it accurately but relentlessly, like an experienced employee of a cleaning service, cleans out everything that it considers unnecessary and foreign in the living organism, moreover, notice, it protects the organism from the aggressive effect of the environment, which in our time is never ending. And now, let us clarify: what is "everything"? No one will deny that what is unnecessary in our organism includes parasites, moulds, fungi, all types of pathogenic microorganisms and radionuclides. A special miracle is the "behaviour" of resin with respect to bacteria. Performing the function of an antiseptic and antibiotic, it acts intelligently and selectively, and recognizes useful microflora, supports and restores it, but destroys and recycles pathogenic microflora, which, by the way, suppresses the development of "native" microorganisms. And viruses! Here I propose a short tour of the subject. All representatives of the earth's flora and fauna have genetic links to viruses. Of the human genome, 30% consists of information copied by virus-like elements, which can cause mutations, including such significant ones as chromosomal reorganization. Some of them, that is, the most promising, obtain a selective advantage. This is constructive, since the organism must manage to adapt to the continually changing conditions of existence. And in our time, changes in the living environment have acquired exceptionally high-speed characteristics. Notice that for the present we are speaking about natural changes related to evolutionary processes. This suggests the conclusion: a certain category of virus-like elements are the material carriers of the program for the development of all living organisms. But there are thousands of varieties of other viruses. Killer viruses. Their prime living environment is the intracellular and intercellular space, there are also those that damage the cell nucleus. In the event of an infection in the cell, special mechanisms for antiviral defence are activated. The affected cells begin to synthesize signal molecules-interferons-which take the surrounding healthy cells to an antiviral state and activate the immune systems. The damage produced by the multiplication of the virus in the cell can be detected by systems of intracellular monitoring, and this cell will have to terminate its life in the course of the process known as apoptosis (programmed cell death). The virus's survival directly depends on its ability to overcome antiviral defence systems. Therefore, it is not surprising that many viruses in the process of evolution have acquired the ability to suppress the synthesis of interferons and deceive the apoptosis program. In essence, the virus begins, with impunity, to reprogram the host cell. Some of these may enter a latent state, practically not interfering with the processes occurring in the cell. They are activated in certain conditions. The multiplication strategy of several bacteriophages, for example, is constructed in this way - as long as the infected cell is in a favourable environment, the bacteriophage does not kill it, but in this case is inherited by daughter cells and is quite often integrated into the cell's genome. When the cell enters into an unfavourable environment, the pathogen takes control of cellular processes in such a way that the cell begins to produce the materials from which new bacteriophages are made (the so-called lytic, or cell-destroying stage). The cell turns into a factory capable of producing many thousands of bacteriophages and, having multiplied repeatedly, they burst the membrane, thus killing the cell. This phenomenon is related to the appearance of certain oncological diseases. In general, all diseases are caused by morphological change - gross non-inherited changes in the phenotype of the organism under the influence of extreme environmental factors. And here I have in mind the aggressive nature of the environment caused by inappropriate human activity. So, the claim exists that viruses that take root inside a cell, especially in a cell nucleus, are impossible to remove, even with the use of the most modern methods of cleansing. This claim is true, but just not for resin. Since it easily penetrates a membrane, resin destroys and removes from a cell not only all viruses, but poisons as well, toxins of varying origin, including those from intensive chemotherapy, and foreign bodies, for example, radionuclides and heavy metal salts. Moreover resin neutralizes the consequences of such human "inventions" as alcohol, tobacco, vaccinations, modern methods of processing and storing food products. Ultrasound examinations are quite another topic! I have the impression that few people know about the harmful influence an ultrasound examination has on the organism. Although the truth is not hidden from us. The results of experiments done by biological scientists are published, although not widely. A chromosome, placed in clean water, emits pleasant melodic sounds, moreover the musical phrases never repeat. The sound is coded information, and in this circumstance, it is genetic. After a chromosome is acted upon by ultrasound of the frequency used in an ultrasound examination, the melodic sound is replaced by a plaintive drone. This means that a portion of the genetic information has been destroyed. What to do about this? A majority of people have experienced ultrasound examinations repeatedly! And it is especially a pity for pregnant women. In these cases, wood resin is genuine salvation. When wood resin comes into contact with the human genetic system, it eliminates the destructive programs that have taken root in the genome and restores the lost natural programs. This property to some extent is possessed by all biopolymers, but the most universal in their action on the human organism are the resins of the Siberian cedar and larch. The results of many years of practical experience confirm the possibility of genetic rehabilitation. I shall illustrate with this example: a novice user of a personal computer, having removed files from his Trash, thinks that he has gotten rid of them forever, but any programmer can restore the lost information in a few minutes. Thus also, a person cannot irretrievably lose anything that Nature has endowed him with. Within this topic it is interesting to compare the properties of resin and water. Water is a very sensitive, mobile, and responsive substance. It may be conveniently used as a carrier of information - it can be recorded, overwritten, cleared, and given the properties necessary for the solution of a concrete problem. Resin, on the other hand, carries standardized natural (or divine, if you like) information, and a person cannot influence, erase, or reprogram this information. Thanks to this property, resin indeed fulfills its basic mission: to revitalize and revive, clean, restore what was lost, and protect from harm. That is, to preserve.